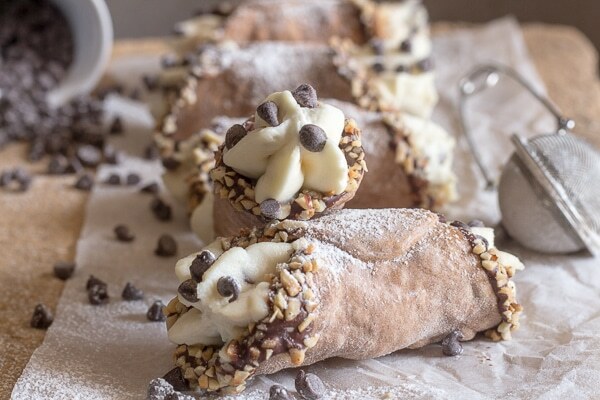 Creamy Homemade Baked Cannoli. Cannoli, baked not fried, just as delicious but a little bit healthier. 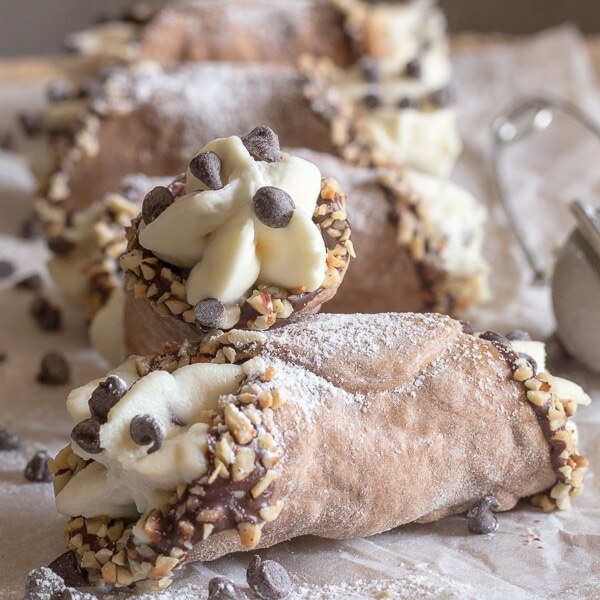 Filled with a creamy Ricotta Chocolate Chip Filling, Perfect! 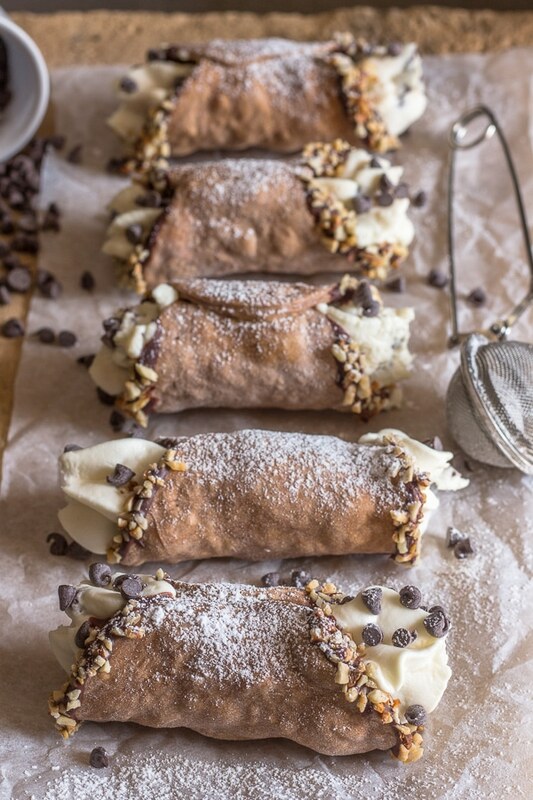 If you asked an Italian what their absolute favourite pastry is, without a doubt they would answer Cannoli! 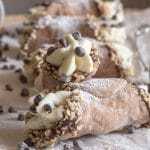 Cannoli originated from the South of Italy, in Sicily. Typically they are made in a tube shape, from small to extra large and deep fried. 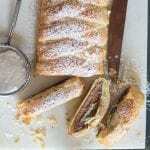 The tubes are then filled with a sweetened Ricotta filling, sometimes filled with cut up candied fruit. My daughter and her father have been asking me for ages to make Cannoli. So the other day I was at the Bakery buying bread and right in front of me was a huge tray of Cannoli. So I thought “ok what the heck, Cannoli it is”! A recipe for the dough I had, but I really didn’t want to fry them. Because let’s face it, frying is such a mess! So I opted for baking. 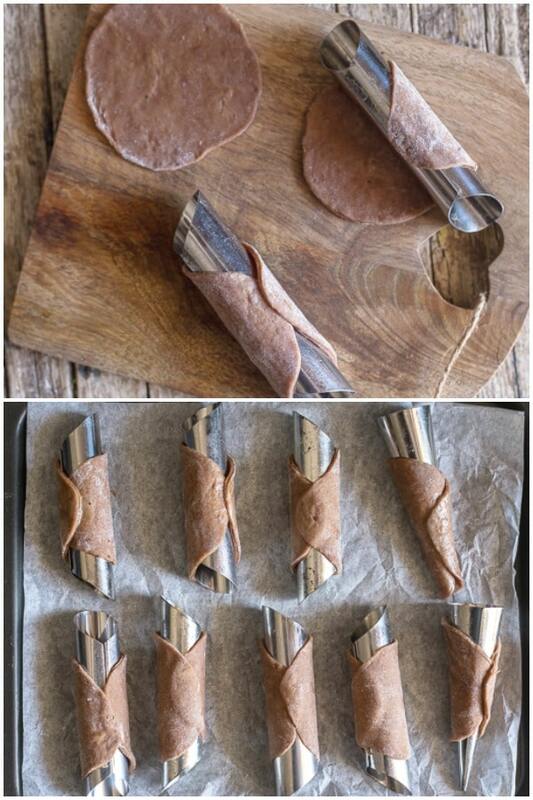 I also thought that even if you don’t have the tubes needed for making the Classic Cannoli, you can also make your own by rolling up some foil into a similar shape! Or you could make mini tarts! Ok so the dough was made and baked and dipped with melted chocolate and chopped nuts, so I figured the hard part was done. I was wrong! I knew that you needed three ingredients for the filling, ricotta (I use cow’s milk, the traditional is Goat’s milk, but we (meaning me and my daughter) find it too strong), sugar and chocolate chips or candied fruit if you prefer. I did some searching and discovered that if you want a creamy filling, you should beat the ricotta, (after you let it drain for a few hours), with the sugar and then fold in some whipped cream. And this is what I did and both the Italian and his daughter were not impressed. It tasted good, although the whipped cream flavour was too dominant, not a good thing, and it wasn’t stiff enough! I did a couple of things different, for example, I let the ricotta drain for 24 hours instead of three, then using a spatula I pushed the ricotta through a sieve, just like she said, believe me it worked perfectly, the ricotta was so creamy. I also added less sugar. I gently folded in the chocolate chips, filled up my pastry bag and filled the tarts. And they were enjoyed by all. I hope you enjoy them too! 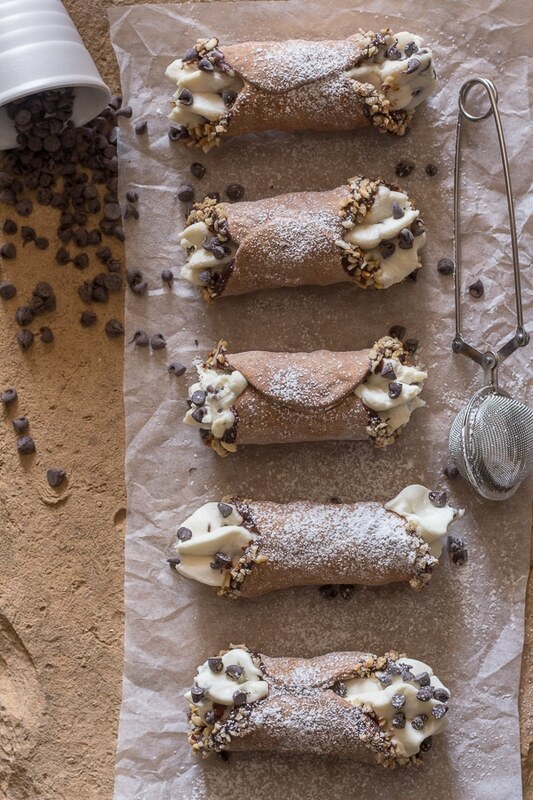 And since June 16th is National Cannoli Day why not make a few?! 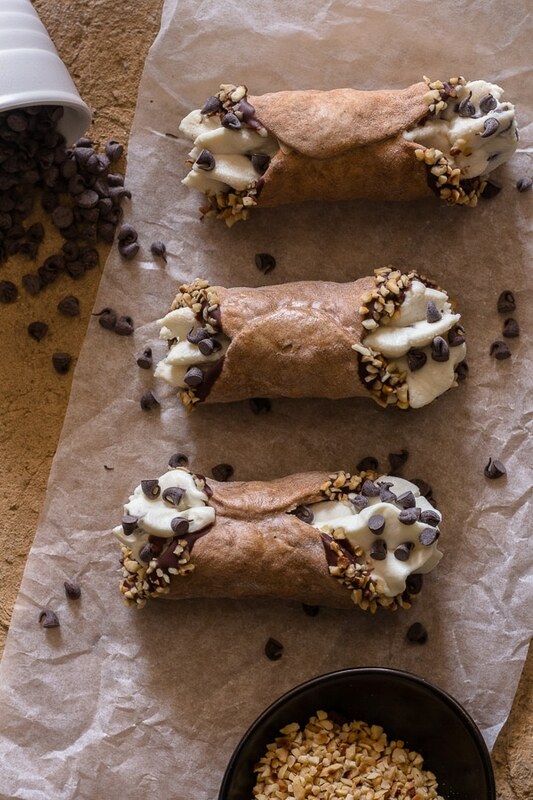 Creamy Homemade Baked Cannoli, a delicious Italian Dessert Recipe, with a creamy Ricotta, chocolate chip filling. A Classic Italian. 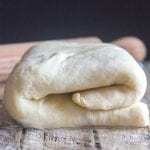 Place Ricotta cheese in cheese cloth or in a sieve over a bowl and refrigerate for 24 hours. It has to drain as long as possible to remove excess moisture. Remove from fridge and with a spatula over a clean bowl push the ricotta through the sieve (remove from cheesecloth and place in a sieve). This will make it nice and creamy, add sugar a little at a time and taste until desired sweetness (I used 1/2 cup of sugar you may want more or less). Fold in chocolate chips. Place filling in a pastry bag with a large tip and fill tarts, make sure to fill tarts just before serving. You could also fill tarts using a spoon. Top with powdered/icing sugar or extra chips if desired. Enjoy! In a medium bowl whisk together flour, sugar, cocoa and cinnamon, make a well in the middle and add butter, egg and wine mixing with a fork. Bring it together to form a dough. Wrap in plastic and refrigerate for 20 minutes. Pre-heat oven to 350°, lightly grease and flour 15 cannoli tubes or even mini tarts. Or make your own tubes with rolled up pieces of foil. Roll dough out very thin** and cut with a round cookie cutter (medium size) to fill muffin tins, prick the bottom of the tarts with a fork a couple of times, then top each tart with a square of parchment paper and fill with dry beans. 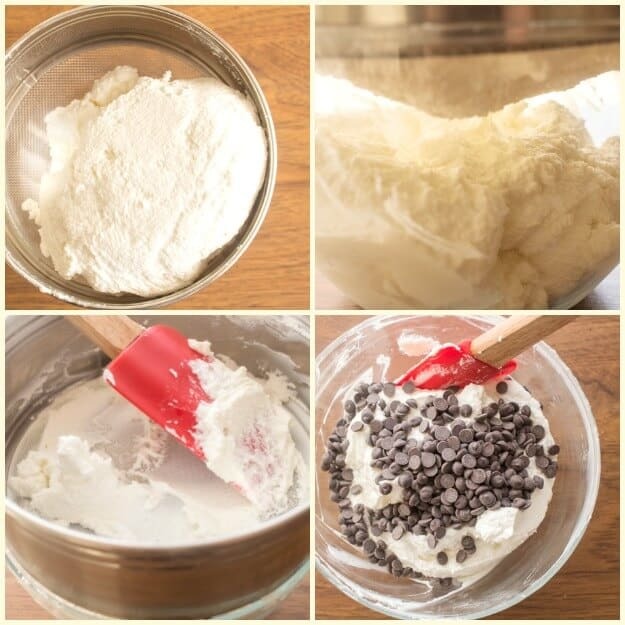 If using cannoli tubs, wrap the pastry so that it overlaps and seal by brushing with a little egg white (beat slightly). Bake for approximately 15 minutes or until pastry is golden. Let cool completely before coating or dipping with chocolate and nuts. Break chocolate into pieces and melt (either microwave or place chocolate in a small bowl and place over a small pot of boiling water make sure water does not touch bowl with chocolate). Let cool a little then coat each tart with chocolate. Set aside to harden. **Dough must be rolled very thin. A little bit thinner than a quarter. Would you recommend powdered sugar I’ve often made cannolli filling before never used granulated sugar though. These look delicious. Putting on my “to do” baking list. Hi Ann, thanks so much, I hope you enjoy it. Hi Karen, I think you are right and it will be too soft, this filling does come quite thick but I really don’t think it would be thick enough. Hope that helps. Try mixing in 8 oz. of mascarpone into the ricotta cheese mixture, I’ not even a close Italian, but this works, Add a drop of cinnamon oil too. You don’t need to drain the ricotta. 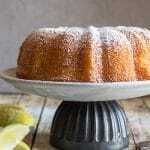 i made this recipe and it didn’t turn out as expected, i feel i made errors on my own part. 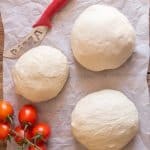 what consistency should the dough be? it seemed sticky to me, so i added more flour. and when i baked them, they were still soft and not brown. do they harden more while left out? i ended up baking for an extra 10 minutes and that may have been a bad call. the shells turned out very firm and didn’t break easily when bit into. i think i may have to roll out the dough thinner, as well. i come from an italian-american family and i wish to learn how to cook all sorts of italian foods, but i am still a novice. thank for you any assistance. What do you recommend to be substituted for the wine in this recipe? Hi Holly if you are looking for something non alcoholic how about white grape juice? I have never tried it but it should work. Let me know how it goes. Have a good weekend. Hi how long do these last? Do the shells freeze well? Hi Tee, you really should eat these as soon as possible because once they are filled after a day or two the shells can go soggy. You can freeze the baked unfilled shells, they keep frozen for up to two months. Hope that helps. Oh yes! I will freeze them without the filling then. Thank you so much!!! Can’t wait to try them! Hi Karen, yes it is only 1 1/2 tablespoons of butter. Hope you enjoy them, let me know. Have a great week. Advice from another website described supermarket brands of ricotta as unsuitable (nasty) for making really tasty, creamy filling. If that is the case, what brand of rocotta is truly smooth & creamy or what can be added/done to the ricotta to make a more tasty filling? Hi Marti, I don’t know if you have Santa Lucia there but I like that brand. Hope that helps. You have truly inspired me here. I suddenly feel the strength and confidence to actually try to make homemade cannolis. Mostly because these look so stinking delicious and I don’t know where I could buy any that would measure up. Here goes nothing! Hi Karly, haha so glad I inspired you. And yes they are pretty delicious. Let me know what you thought of them. Have a great week.